From the creators of AcroYoga MB, MB Fitness Professionals, MB Association for Sikaran Arnis and PhAT Camp comes the DE-EVOLUTION of daycamp! 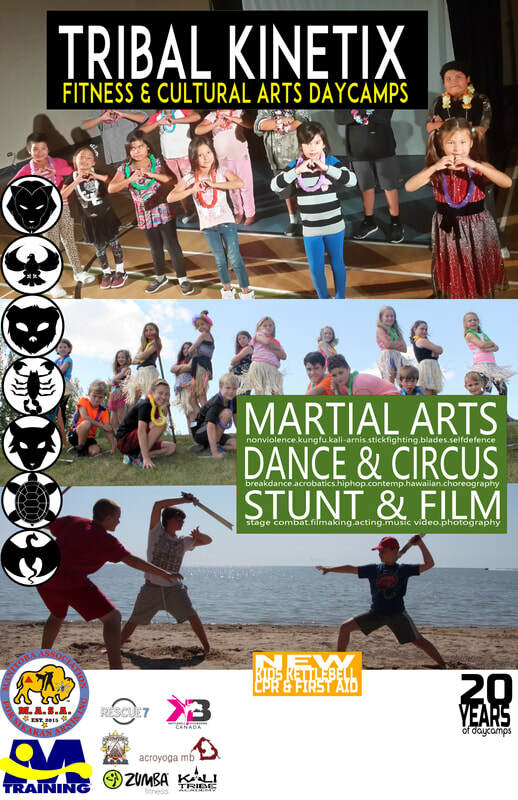 Blending our Tribal Cultural Arts & Values, Dance, Martial Arts, Stagecraft, Cirque Arts and Digital Media, KTA Tribal Kinetix Daycamps brings over 30 years of Award-Winning, Family & Fitness oriented programming expertise to your community this summer. Exclusive, copywritten programs such as B.A.A.D., Kettlebell Kickboxing, Xtreme Dance Combat, STUNT Kinetix, South Seas Hula and more.. Cultural Values are at the forefront of what our leadership has been doing for over 30 years. In addition to promoting values such as the 7 Sacred Teachings, we bring the WORLD of values to our kids doorsteps. These values are universal, whether AFRICAN, ASIAN, PAN-AMERICAN, FIRST NATION & POLYNESIAN. We beleive in integrating these values into the programs we provide. Join the squad and keep spirits high with pumped up dances, cheers, & stunts. R&B, house, lyrical, old-skool, pop, krump, bboy/bgirl, locking.. Explore movement, music and creativity with modern and street jazz. Basic Hula movements while learning a traditional song. Girls and Boys class. Xplore rhythms w/barrels, brooms and create your own instruments. FLASH MOB / DANCE MOB Fun routine for sudden public performance in town! Masculine Polynesian ‘war-dance,’ explores some of the toughest movements around. Creative movement, dance & gymnastics. Fitness based Yoga for kids, with stretches, postures and fun art activities. improv, acting, comedy and all around silliness in 1. Bring your pie and your slapstick comedy to the table! Partner Yoga with balancing and acrobatic movements! Simple defence tactics and psychological skills to help boost your own confidence. 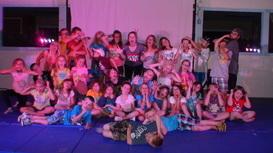 CIRCUS :SKILLS Learn some fun and entertaining circus skills. Juggling, Handbalancing, Contortion, Flower Sticks & Poi!! Kali, seen in films like Bourne Trilogy, 007, Book of Eli and TV’s ‘Arrow.’. Sticks, Knives & Boxing. A fun Ninja spoof for film or live performance. Rhythmic tribal stick/staff combat moves, stunts & music beats. Martial arts action moves for stage and film! A great way to teach nonviolence through technical understanding of film stuntwork. Create characters & scenes on the spot and develop presence and communication with games, story-telling and acting. Direct or perform in a fun Music Video! FILM-MAKING Lights, Camera..Action! Group filmwork or a short film project! Compose & Click! Bring a cam. Walk, pose, present your fashions for runway or photo modeling. MOVIE TRAILER Sometimes the movie preview is more fun the film itself...here you get to make one! Learn to save a life! Varies by location. ZUMBA Popular Latin-based dance workout that’s taking the world by storm!